Wooden lockers by Sawdust City—like everything we offer—are all made in Eau Claire, Wisconsin. Our wood lockers are meant to be lined up side by side and are fantastic storage furniture without taking up too much room. Check out our many wood locker options: standard entryway lockers with shelves and hooks, shoe lockers with numerous shelves, short lockers to stand alone for small kids, or sit on top of our locker benches! We have a 3-space single locker unit, corner lockers, and deep locker benches for placing short wood lockers on top. Your mudroom storage furniture solutions can all be found here! 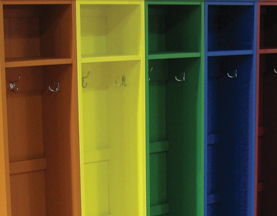 Choose from over 40 colors and two finishes to make your locker system unique!